The Air Force’s new chief of staff, Gen, Mark Welsh III faces several immediate challenges that include repairing the Air Force’s reputation, which has been mauled by the scandals at Lackland, Dover and the budget battle with Congress. We lay out the major problems facing the Air Force and talk to experts about what needs to be done to fix what’s wrong. In other matters, when the Air Force got rid of selective re-enlistment bonuses for airmen in Zone E, it screwed over airmen like Senior Master Sgt. Timothy Pachasa, a Tactical Control Air Party airman deployed to Afghanistan. Pachasa recently found out that the $90,000 re-enlistment bonus he had been counting on will expire eight days before he becomes eligible for it. And the remains of two airmen killed when their plane went down Vietnam in 1966 have finally been laid to rest at Arlington National Cemetery. Reporter Kristin Davis was present at the solemn ceremony that ended decades of waiting for both airmen’s families. General Welsh is the right officer to lead the United States Air Force during these challenging times. With this in mind, I believe the title of the Air Force Times’ article can be a bit misleading. The job of fixing the USAF is not General Welsh’s job solely—it’s every Airman’s job. I believe every Airman is a sensor, and we all have a duty/obligation to respond when we see or hear of a breach in standards. Throughout my short 26 year Air Force career, I have witness young airman and commissioned officers rise to the challenge by consistently looking for better ways to accomplish daily task. Likewise, I’ve sat through planning sessions where non-commissioned officers, DoD Civilians, Air National Guard and Reserve members have spoken out when decisions or plans appeared to run contrary to Air Force Instructions. 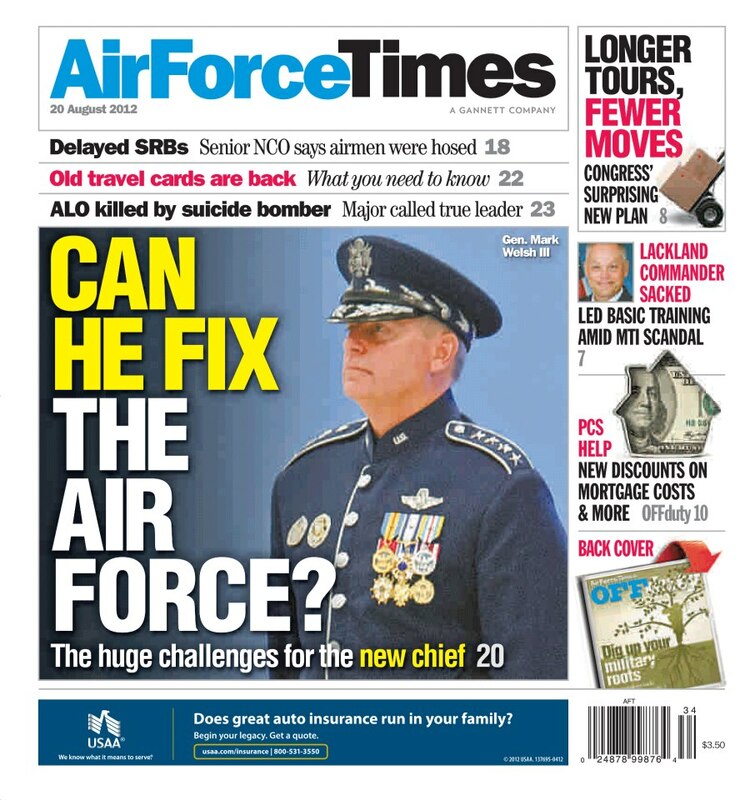 In short, I do not believe the Air Force Times’ article is incorrect; however, if everyone in the USAF does a little no one will have to do a lot. AB, You have a thoughtful position. All AF members, employees, and contractors have a responsibility to maintain standards of the organization. This is an instance where the Total Force concept can make a huge difference. On the hand, the general is the #1 person for setting the tone and assuring that discipline flows throughout the ranks. As such, he does have more responsibility for “fixing” the force and setting straight the culture that led to the issues highlighted in the article. He establishes the vision and strategy, right! From there, it flows down to the lower levels who are tasked with planning, organizing, and executing. To your point, he’s the right man for the job and certainly he will get it done! I can see and appreciate your perspective. General Welsh has set the “cadence” for change and improvement in the AF. I am convinced, Airman will continue to pool their talents and resources as they have in the past to ensure the AF can fly, fight and win. Thanks for the thoughtful posting. Very enlightening thoughts and I’m confident our Air Force Leader(s) will set the appropriate tone and charge our Air Family (Airmen, civilians, contractors and family members to make their (our) AF better. Understand there are significant challenges, some outside of our control and others that we can make a difference, the latter is where we need to focus. Air Force successes rely heavily on competent leadership and that leadership coupled with a dedicated team will produce outstanding results…I’m confident our Air Force will continue to strive. AB, thanks for your reply and it’s really about the team. Together Everyone Achieves More (TEAM). Our core value of Service Before Self is truly indicative of the mindset we (Airmen) must embrace to ensure the collected efforts of the team is at the forefront vs individual agendas. Unfortunately, a team mentality is not embraced by all, how can we change this?